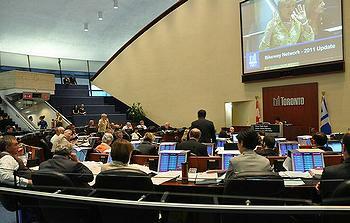 TORONTO, Ontario, Canada, November 29, 2012 (ENS) – Toronto City Council has thrown out its controversial plastic bag ban. City Council voted 38-7 on Wednesday to approve a motion by Councillor Denzil Minnan-Wong that kills the ban they adopted in July. The ban would have taken effect on January 1, 2013. So at this point, the Toronto City Council has endorsed a policy that calls for a ban on plastic bags, but today defeated the by-law implementing that policy. 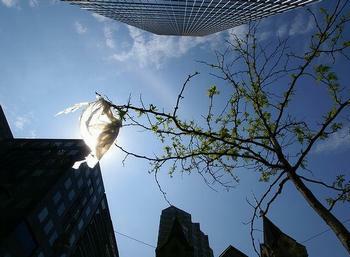 Toronto’s political struggle over plastic bags began on June 1, 2009 when a five-cent plastic-bag fee approved by City Council under then Mayor David Miller, took effect. Retailers kept the five cents they collected for each single-use plastic carry bag they sold. On May 14, 2012 Councillor Michelle Berardinetti asked the Executive Committee to consider a proposal asking retailers to donate the proceeds of the plastic bag fee to the City’s efforts to maintain the tree canopy, reopening the issue of the plastic bag fee. Mayor Rob Ford, an opponent of the plastic bag fee, saw an opportunity to propose doing away with it. On June 6, Council agreed to eliminate the bag fee, but, in a blow to Mayor Ford, Councillor David Shiner proposed banning plastic bags altogether based on environmental concerns. With little public debate or consultation, this new policy was approved by City Council. On November 14, the Public Works and Infrastructure Committee drafted language for a plastic bag ban by-law, sending it to the next full meeting of city council for a vote. The next day the Ontario Convenience Stores Association mounted a legal challenge to the by-law in Ontario Superior Court. The ban is being implemented without proper consultation, the group argued in its court documents. On November 28, City Council rejected the draft by-law. The Ontario Convenience Stores Association expressed relief that City Council withdrew the plastic bag ban by-law. “This is a good day for small businesses in Toronto and we commend Toronto City Council for their thoughtful reconsideration of this by-law and the impact it would have had on convenience stores” said Dave Bryans, CEO of the Ontario Convenience Stores Association. “By selectively prohibiting merchants from providing certain types of plastic bags, shoppers would have been less likely to make purchases and that would have hit Toronto’s small, family run convenience stores the hardest,” Bryans said. Under the council’s rules, it will now take a two-thirds majority vote to reopen the bag ban issue within the next year. That report is due in June 2013. Meanwhile, Mayor Ford is vowing to appeal a court ruling that has ordered him out of office on a matter unrelated to plastic bags. The judge suspended his decision for 14 days so that the city can sort out an administrative path forward.